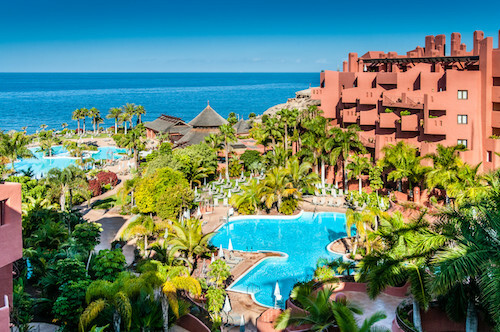 Located in the southern part of the island, Sheraton La Caleta is only five minutes from Costa Adeje Golf, one of the seven golf courses on the island. Nearby El Duque Beach is the perfect place for an exclusive rest. Water sports enthusiasts can windsurf and enjoy other water sports at Médano Beach, also nearby. After a day at the beach or on the golf course, there is one more thing to savor at this Sheraton: the welcome of the guest rooms, which are completely smoke-free. Looking for recreational fun? Golfers can enjoy the serenity and tranquility of some of Spain's most exclusive golf courses, conveniently located nearby. After golf, check out the "Pool Village" with three outdoor pools. There is also a Children's Club with a pool and recreation area. Or test your skills at the mini golf. If all you want to do is relax, plan a visit to the 1,800-square meter Spa Eutono. You'll find multifunctional treatment suites, each with their own private courtyard, a heated vitality pool with water treatments, two outdoor plunge pools, lifestyle showers, sauna, steam bath, and Health Club. There is a variety of room types to fit your needs: Deluxe Rooms; Superior Rooms, which have lateral ocean or lateral pool views; Premium Rooms, with prime ocean views; and Club Rooms, with spectacular views on preferred floors. 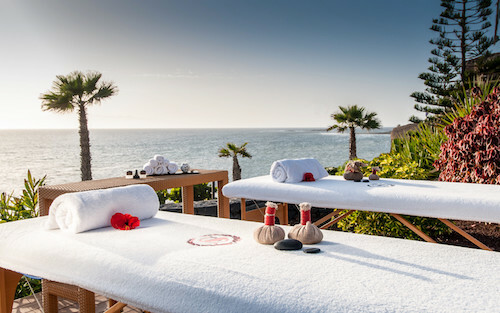 Additionally, they offer Deluxe Suites, Premium Suites, Club Terrace Suites (with a private Jacuzzi), and La Caleta Suite, which includes a large terrace with a panoramic ocean view. Club Rooms and Deluxe Suites can take advantage of Club Service for an additional fee. The service includes upgraded amenities, bottled water, breakfast by the pool, and special access to the Club Lounge. A relaxing, upscale space, the Club Lounge offers afternoon hors d’oeuvres and a variety of beverages. You can also enjoy the private Club Lounge, where you can connect with friends, meet with your team, or simply relax by catching your favorite TV show. Need to get some work done? A separate working space, with printer and free High Speed Internet Access, is open for business. Some of the amenities above may not be available in all rooms. Fees on certain amenities/services may apply. Prices quoted subject to change by hotel. 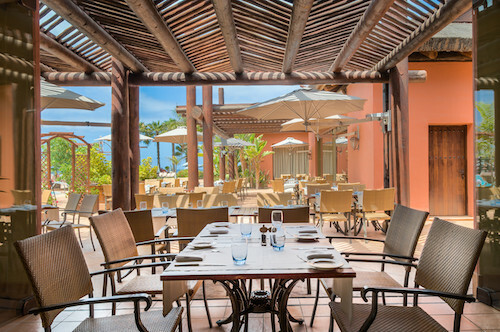 Sheraton La Caleta Resort & Spa, Costa Adeje, Tenerife invites you to sample international cuisine in four restaurants. 24-hour room service is also available . True to its roots, this is the perfect place for tapas and drinks, including wine from La Venta’s own bodega. Its décor and the best of Spanish gastronomy set the mood for the end of a perfect night. Relax beneath the Canarian sun and savour a light Mediterranean-style meal with a refreshing cocktail as you gaze upon the island of La Gomera and the expanse of the Atlantic. Every meal here is unique, from full breakfast buffets with show cooking to dinner buffets whose themes change daily. Family and friends will be intrigued by the variety of food stages and amazed by a wide selection of gourmet food. In the middle of a subtropical garden, sip on a cool, refreshing drink under the shade after a swim. Enjoy the full bar’s variety of cocktails, or simply take a break in the breeze with your choice of ice cream. After a full day of excitement on the island, relax with friends, family, and a drink at sunset with a view of the Atlantic. This bar has a wide selection of cocktails and quality wines by the glass, as well as live music on some evenings. Tenerife, the largest Island of the Canary Islands, offers a large variety of landscapes and attractions. Discover breathtaking beauty at the Cañadas del Teide national park or Los Gigantes cliffs. Explore the northern part of the island by experiencing traditional Canarian architecture and cuisine in the nearby towns of Santa Cruz, La Laguna, or Icod de Los Vinos. • El Duque Norte Beach - 1 minute's walk from the hotel. A new black sand beach. Guests of Sheraton La Caleta will have sunbeds and parasols for hire, changing rooms and lifeguards on duty. There are also three access points for people with reduced mobility allowing wheelchairs to reach a wooden platform.